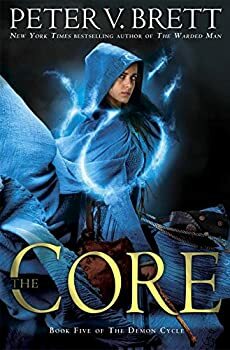 With The Core (2017), Peter V. Brett brings his well-received DEMON CYCLE series to a climactic close, rounding up the slew of characters he’s introduced along the way and given most of them (at least of those who have survived to this point) at least some moments of stage time for a fond farewell. I’ve enjoyed the series ever since its opening with The Warded Man, and while I had some issues with this final book, overall The Core makes for a satisfying conclusion and makes it easy to recommend the series in its entirety. I’m going to assume you’ve read the prior books, so I won’t bother recapping them, and as usual, you can assume there will be spoilers for those years’-old novels (but not for this one). As noted above, at this point Brett has introduced us to a boatload of characters, and a good number of them get focused on here, including but not limited to Arlen, Jardir, Lessha, Renna, Inevera, Briar, Ragen, Elissa, and Abban. Even the demon consort, Alagai Ka, gets his own POV now and then. On the one hand, it’s nice to see these characters’ stories resolved and this broad-beam narrative structure allows the reader to get a feel for the wide-spread impact of this war, as opposed to focusing on just the plucky band of heroes on their lonely quest. The downside is that sometimes the arcs feel a bit thin or rushed, and even tangential, despite the book’s nearly 800 pages. Also, despite the individualized stories, because the characters are often in similar situations (battling demons/embroiled in politics), there can be a bit of a repetitive feel to the action. The reason this doesn’t feel like more than just “a bit” is because of Brett’s sharp individuation of each character, all of whom feel wholly their own selves rather than appearing as character types. And certainly, over the course of the series, many have shown growth and increasing depth as well. In fact, it’s probably because so many are such strong characters that I wanted to spend more time/focus on the handful of my favorites. For instance, I would have liked to spend more time with Jardir and Arlen, not because they are “main” characters but because I find their rivalry/alliance to be so fraught, and their philosophical differences so rich and ripe for exploration, that spending so little time with them, and some of that in action scenes, I felt a little deprived. In terms of plotting, Brett eschews the flashback structure of the earlier novels, relating the story in the constant here and now, which adds a driving sense of urgency and tension to the storyline and is therefore, I’d say, a good decision on his part. I’m not sure we needed all 800 pages, but the story unfolds smoothly and easily, moving along at a mostly good pace, allowing me to happily finish The Core in just two sittings. Individually, the battle scenes are vivid, exciting, and anxious. Cumulatively, they did wear on me a bit. Part of this was that the general action was a lot of the same — drawing wards, overwhelming odds, weary defenders, drawing wards, shattering rocks, etc. And part of it was that the magic for me is a little overwhelming/easy. That said, I can see how others will react differently to both the system and the fight scenes, thrilling to each and every one. Your mileage may vary. As far as the ending goes, it felt a little rushed and maybe even anticlimactic, but at the same time wholly appropriate and consistent with where we’ve been traveling this entire series. And that’s all I’ll say about that to avoid the obvious spoilers. The DEMON CYCLE started out strong with The Warded Man, and the books have consistently ranged between fours and fives for me on our 5-star scale, with The Core as a four. It should be fairly evident then that I highly recommend the series (which reminds me to go back and note this in my review of book one, since hey, you’re already reading the series if you’re here) and state that Brett has managed to pull off a mostly satisfying conclusion that retains the high standards of the previous books. Published October 3, 2017. 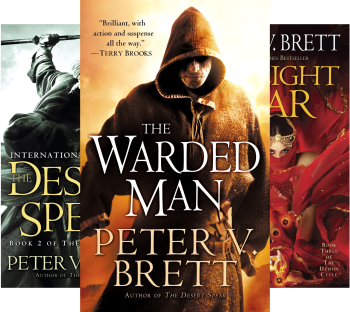 New York Times bestselling author Peter V. Brett brings one of the most imaginative fantasy sagas of the twenty-first century to an epic close. For time out of mind, bloodthirsty demons have stalked the night, culling the human race to scattered remnants dependent on half-forgotten magics to protect them. Then two heroes arose—men as close as brothers, yet divided by bitter betrayal. Arlen Bales became known as the Warded Man, tattooed head to toe with powerful magic symbols that enable him to fight demons in hand-to-hand combat—and emerge victorious. Jardir, armed with magically warded weapons, called himself the Deliverer, a figure prophesied to unite humanity and lead them to triumph in Sharak Ka—the final war against demonkind. But in their efforts to bring the war to the demons, Arlen and Jardir have set something in motion that may prove the end of everything they hold dear—a swarm. Now the war is at hand, and humanity cannot hope to win it unless Arlen and Jardir, with the help of Arlen’s wife, Renna, can bend a captured demon prince to their will and force the devious creature to lead them to the Core, where the Mother of Demons breeds an inexhaustible army. Trusting their closest confidantes, Leesha, Inevera, Ragen, and Elissa, to rally the fractious people of the Free Cities and lead them against the swarm, Arlen, Renna, and Jardir set out on a desperate quest into the darkest depths of evil—from which none of them expects to return alive. OH MY GOSH THIS LOOKS AMAZING. I have the first book and now I know I’ve totally got to read it. You make the series sound amazing! It’s good to hear that they have fairly consistent quality.